We are offering Brick Making Machine. The offered machines are precisely designed to speed-up the productivity and also to reduce the effort of labors and staffs. Incorporated in 2015, we "Vishwakarma Creative Engg. Pvt. Ltd. " is the most prominent enterprise that is engaged in offering heavy duty machines for civil industries. 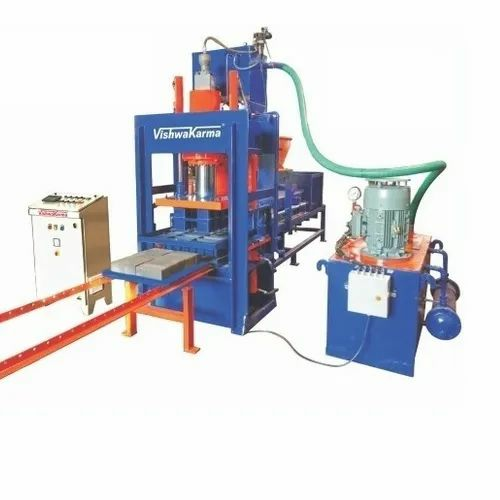 We are Manufacturing a robust and innovative assortment of machines that include Brick Making Machine, Block Machine, Fly Ash Silo, Mixer Machine, Hydraulic Press Machine, Tiles Mould and more. The offered machines are precisely designed to speed-up the productivity and also to reduce the effort of labors and staffs. Furthermore, we are broadly appreciated by our clients for offering unmatched quality machines with high utility features. Precisely manufactured by a crew of talented and experienced professionals, our offered machines have no alternative in the market. These are widely acclaimed owing to their consistent performance, excellent control mechanism, easy installation, long service life, energy efficiency, robust construction and unmatched design. Besides, we also provide a wide range of Interlocking Pavers and Galicha Designs with high utility features that keep us apart from the crowd. We have an advanced and well-constructed infrastructure located at Ahmedabad (Gujarat, India) that drives us to manufacture these machines with high-utility features. For years, we have been catering the demand of numerous civil industries and builders, efficiently. We have kept nominal prices for these construction machines that are another aspect to beat the competition and also to draw the attention of our target clients. For the comfort of our clients, we accept payment from different modes like online, DD, cash and cheque. Our values and ethical business policies aid us to get a competitive edge over our competitors. Our mentors "Mr. Pruthul Gajjar" and "Mr. Murgit Gajjar" guide and motivate us to meet the exact requisites of the clients within the stipulated time frame.